With more snow on the way, Scotland's farmland birds have been thrown a valuable lifeline thanks to continued use of seed-rich wild bird cover plots across the country. With the prolonged snow and ice, these plots have acted as giant bird tables, providing a range of seed for birds struggling to find food. 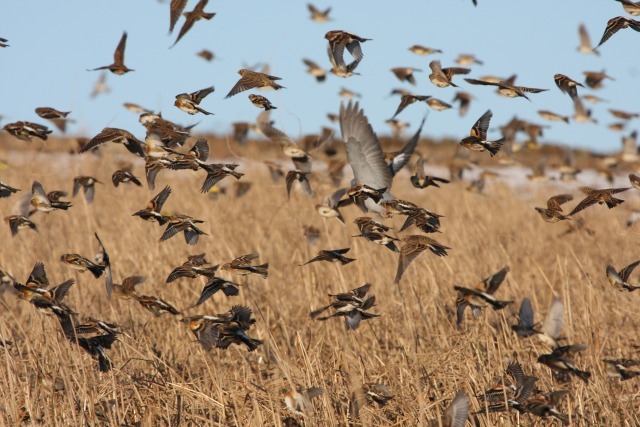 One farm in Angus has reported tens of thousands of birds feeding on a relatively tiny two-hectare plot of land given over to wild bird cover, an event unprecedented in the farm's history. 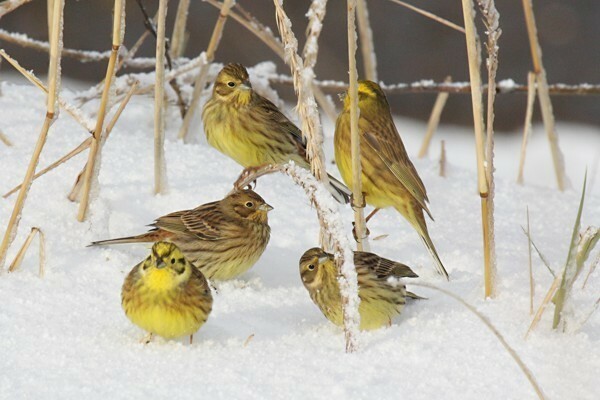 For several species, such as Corn Bunting and Yellowhammer, the lack of winter food has been a significant factor in their population declines. With Scotland experiencing one of its worst winters for over four decades, RSPB Scotland believes the use of wild bird cover has never been so important. Wild bird cover plots can be financially supported through Scotland's agri-environment scheme, for which every farmer can apply. Hywel Maggs, Conservation Officer with RSPB Scotland, said: "It's been a difficult few weeks for all types of wildlife, and it is fair to say that many more farmland birds would have perished in the cold without these feeding havens. These plots are sown with a mixture of seed-bearing crops such as oats, barley, kale and mustard, providing a variety of seeds for different species over the winter months. Our thanks go to those farmers who have already taken the time to incorporate them into their land and we hope, with the continued support of agri-environment grants, that others will be able to follow their example." Research suggests that 1–2 hectares of wild bird cover in every 100 hectares of farmland can sustain the local farmland bird population over the winter months, and RSPB Scotland are encouraging others to consider putting plots in for next winter. 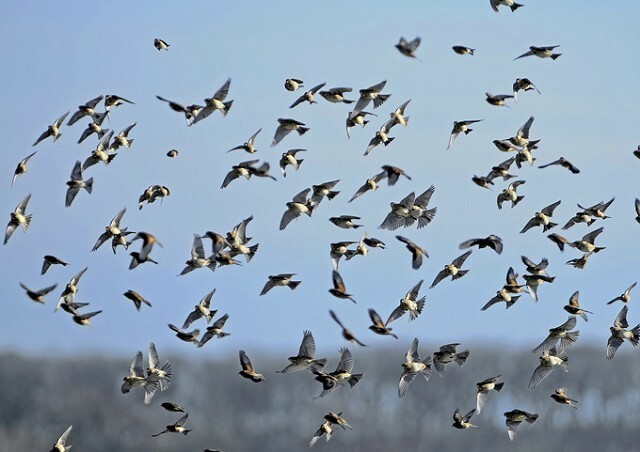 Their value has already been highlighted on a number of farms across Scotland, with record-breaking counts of farmland birds flocking to take advantage of the seed supply in wild bird cover plots. A farm near Reston recently recorded over 2500 birds, including over 900 Yellowhammers, 300 Tree Sparrows and 300 Linnets, along with numerous Reed Buntings, Bullfinches, Goldfinches, Skylarks, Greenfinches and Chaffinches. RSPB Scotland's Mersehead Nature Reserve reported record-breaking numbers of species on its wild bird cover crops during its December Farmland Bird Study. The counts included 2600 Linnets, 101 Yellowhammers, 229 Reed Buntings, 1200 Skylarks and smaller numbers of Bramblings, Tree Sparrows and Chaffinches. Douglas Brunton's farm near Arbroath was visited by flocks of 5000 Skylarks, 2500 Bramblings, 105 Corn Buntings, 1700 Yellowhammers, 700 Reed Buntings, 600 Snow Buntings, 200 Linnets and 10 Lapland Buntings. Mixed farmland birds using cover valuable cover crops (photo: Hywell Maggs, RSPB Scotland). Douglas, who introduced two hectares of the wild bird cover earlier this year after joining an RSPB-led project to help the Corn Bunting, said: "The original reason for the wild bird cover was to provide a nesting habitat and winter feed to support the Corn Bunting population of the area. The winter feed has been more successful than we ever anticipated and the counts of over 100 Corn Buntings seen feeding in the crop recently has been very pleasing. The huge flocks of other birds feeding there just shows how necessary this type of crop is when the weather is severe. It is good that we can fit these types of crops into our arable rotation. " For more advice on wildlife-friendly farming, visit www.rspb.org.uk/ourwork/farming/advice.